This large home is perfect for your next executive retreat or upscale family vacation. This custom home is surrounded by lawn, flowers, mountains and trees. 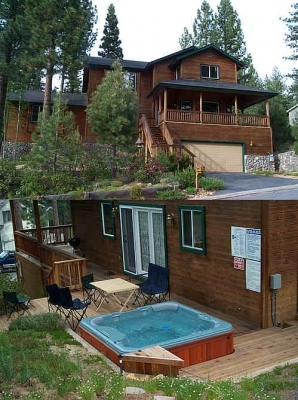 This home is in a quiet residential neighborhood and only minutes to skiing or the casinos. The master suite features a view of the mountain and a large private bath. The vaulted ceiling living room has a wonderful open feel and has a surround sound system for the TV/Stereo system and a cozy gas-log fireplace. For the kids there is a Nintendo system as well. The large tile kitchen is a gourmet's delight with all conveniences and is a pleasure to be in. The home also has beautiful deck on three sides and has a wonderful hot tub ready to sooth away all your cares or aches from a hard day of vacationing! This home represents a true luxury vacation experience, one you are sure to enjoy! The sofa bed is available for additional guests, sleeping a total of 8.